Deposit Methods: Bitcoin wallet, Ethereum wallet, NETELLER, Sofort, SEPA, OKPAY, Local P2P, Wire Transfer, MasterCard, Visa, Skrill, AstroPay. Withdrawal Methods: Bitcoin wallet, Ethereum wallet. Software: Amaya, Betgames, Betsoft, Endorphina, Ezugi, GameArt, InstaDeal, Microgaming, PlaynGO, Takisto, NetEnt, Evolution, Explosive, iSoftBet, Booming, Pragmatic Play. Languages: English, Japanese, Portuguese, Russian, Spanish, Chinese. Bitcoin’s popularity is fueled by its anonymity – we do not collect your personal data and you can use coins to deposit from anywhere in the World. Play the most popular bitcoin slots and tables games at BitCasino.io! More information on bitcoin can be found here. For our new players we offer an exclusive welcome bonus of 110% up to 1BTC (1000 mbtc) for players that will signup from NoDeposit.org, use code: EXNO110 on signup, playthrough 35x. Join our bitcoin casino instantly by registering a free account in no more than 15 seconds! Once you have made your first deposit, send a message to our support staff using live chat and we will credit the bonus to your account immediately. You can find our bonus terms & conditions here. Our list of games features popular 3D video slots such as "Mr. Vegas" as well as traditional games like blackjack and roulette. We also offer LIVE dealers including Live Dice and Live Lotto games, dealt by the most beautiful girls! In total we have more than 110+ bitcoin casino games… You won’t find same amount of games anywhere else! Read feedback of our players on the biggest bitcoin forum! 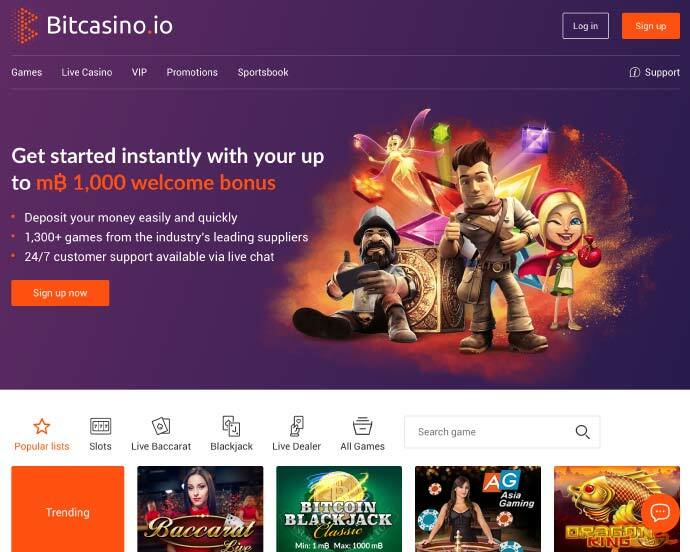 BitCasino.io is a brand owned and operated by mBet Solutions NV, which is licensed to conduct online gaming operations by the government of Curacao under the gaming license 8048-M2105544. The site is powered by the Coingaming.io Bitcoin Gaming Platform. Bitcasino.io does not accept players from the following countries: United Kingdom.